Hallmark Care Homes has held a ‘topping out’ ceremony to mark a milestone in the construction of an £8m, 77-bed residential and dementia service in Banstead. 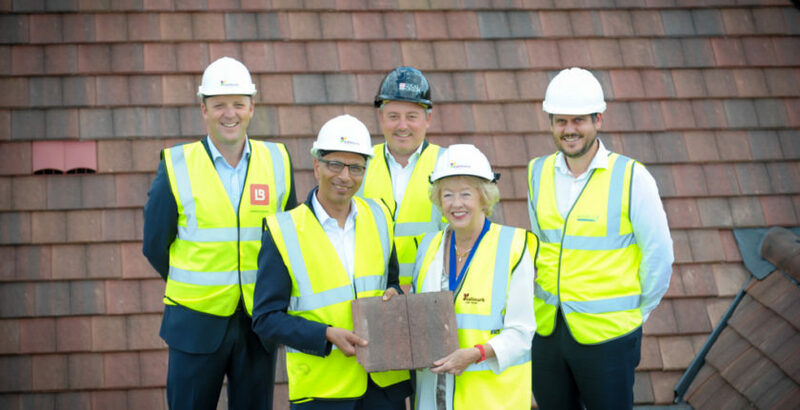 The site’s construction team were joined by Hallmark Care Homes Managing Director Ram Goyal and the Mayor, Councillor Dorothy Ross-Tomlin to mark the next stage of the build as the last roof tile was officially laid. Ram said: “We are really excited to be opening a brand new care home in Banstead and look forward to providing high-quality relationship-centred care to the community. Facilities at the home, which is being built by specialist care contractor Lawrence Baker, will include a state-of-the-art cinema, hairdresser, therapy room and café. Other communal areas will include an interactive kitchen where residents can assist in the preparation of meals and landscaped gardens designed by late, award-winning landscape architect, David Fountain. Banstead Manor is scheduled to open its doors to its first residents in spring next year.